It’s been my biggest adventure (so far): from Dunkirk through the windswept low countries and then Germany and the beautiful Rhine Valley; following the meanders of the River Main and the long open stretches of the Main-Donau (Danube) Canal; the rainy days along the Danube; the increasingly warm weather as I left Austria and entered Slovakia; the spectacular view of the Basilica at Esztergom as I re-crossed the Danube into Hungary; the unpredictable road conditions of Romania and the beautiful wooded Carpathian Mountains. And countless river crossings by ferry and bridge. Besides all this, I met so many hospitable and helpful people, showing that I wasn’t so much the independent traveller as one who depended very much on others. In fact, once my brothers joined me near Budapest, I was happy to take a back seat and let them deal with navigation and finance. But while all this was a great experience for me, the purpose was to raise money for the new project at Little John’s House. So it was a great moment when we arrived at Cisnadioara (see photo), although my memory of the village (from 1996) failed me when it came to finding the home itself. It took a phone call to Mags (founder and director) to locate it (see photo). The two photos of the village show that this is not a wealthy place, but by contrast some very smart new houses are being built there – it is, after all, in a beautiful setting with the background of the Carpathian Mountains. This means that land prices are increasing, so the charity trustees want to take the opportunity now to acquire a nearby plot to extend their work and cater for more children. So if you have already donated, thank you for your support – and if you are still considering it, I can assure you your money will be put to good use. Last but not least, my thanks to Rod and Mags, for help with planning and publicity; FlipAnt of Gillingham, for the customised “Ride to Romania” hi-viz vest, which led to conversations and often donations along the way; Gillingham Press, for the maps which allowed several people to track my progress; David, for his company for the first few days; all those who hosted me or helped me find my way; the cyclists I met and who sometimes accompanied me; the bike-shop owners who did running repairs; all those praying for me and supporting me back home, especially my blog-editors, Elizabeth and Ash; for brothers Roger and Richard, seeing me safely over the last 400 miles; and Anne, for letting me go. Day 45, June 13 – Home! A more complete blog will follow shortly for day 45, but in the meantime it’s Colin’s daughter, Elizabeth, here to say he had safe journey home! Myself and my fiancé, Ash met Dad and his brothers at Luton airport, see picture, to Dad’s surprise, as he had planned on catching the train back to Dorset! We spent a lovely weekend together, hearing all about his adventures.. And he’s delighted that donations are still continuing. It had been an early bed-time, so I was awake for a few hours during the night. Even at 8.00am when we had breakfast, it promised to be another very warm day. We walked down to Little John’s House and Nicu drove us into Sibiu, about 7 miles north. Sibiu, which also has the German name of Hermannstadt, lies close to the geographical centre of Romania and was designated European Capital of Culture (along with Luxembourg) in 2007. Much as I dislike what I call “packaged culture” there is no doubt that the city has undergone considerable renovation since I last visited in 1996, and must have benefitted from its designation. Traditional old buildings in the centre had undergone a facelift and today was the first day of a month long festival of concerts and other cultural events. We had our morning coffee and icecreams in the city centre, then managed to find a small hardware store, where we bought large polythene bags and sticky tape for packing up our baggage and bike boxes for the flight home. We took a taxi to the out-of-town shopping centre where we bought things for the children at LJH – badminton sets, a basket ball, a hula hoop and a skipping rope. We lunched there, then took a taxi back to our lodgings. We later walked down to LJH, where the children seemed to enjoy their new gifts. This time we met Tinca, the head of house. We had also intended to box up our bikes, but Nicu pointed out that because the seats in the minibus weren’t removable, there wasn’t room for the boxed bikes and we would need to do the boxing at Sibiu Airport the next morning. So we put the bikes and flat-packed boxes in, and arranged the earlier time of 9.30am for the journey to the airport. At 7.00pm we went back for our evening meal, again set out in the open and served by Eti (not Edi), Nicu again producing the cherry brandy and the two dogs waiting patiently for leftovers. Finally we made our last walk of the day up the short (but somehow increasingly steep) lane to our lodgings, with a small detour during which Roger and Richard demonstrated their balancing skills by crossing a stream on two pieces of railtrack. Another fairly early night, then back to England tomorrow. Day 43, June 11 – we made it!!! The breakfast table in our apartment had been laid by Roger yesterday evening, and by 8.00am we were tucking into our yoghurt and cereal or fruit mix, fruit juice, coffee and poached eggs on toast. The small cubes Roger and I had bought turned out to be cheese, not butter, and the carton of “milk” was in fact cream. Roger made sandwiches of salami, cheese and tomato which we took for the journey along with fruit and cereal bars – we had decided to avoid stopping for a sit-down lunch. and passed some monasteries (see photo). All the time we were within a mile or two of the southern spur of the thickly wooded Carpathian Mountains. Finally, we joined the road from Sibiu to Cisnadioara. It involved one more long climb through woods before coming down into Cisnadioara. We arrived there at about 4.00pm. I was sure I would recognize the turning for Little John’s House, but after two attempts had to phone Mags (founder and director of the home) to get directions. Arriving at the gates, we were welcomed by Edi and the children, and given coffee and biscuits. Accommodation had been arranged for us at a local guesthouse, and Nicu, driver and maintenance man, came to take us and our baggage there. We left our bikes in the converted barn, now housing dormitories for visitors, where Nicu had already deposited the bike boxes we needed for the flight home. We returned to Little John’s House at 7.00pm, when the staff had prepared a meal for us. Nicu emerged from the house with some plum brandy to help it down and arranged to take us into Sibiu at 10.00am tomorrow morning. Early to bed, safe in the knowledge that we didn’t have to cycle anywhere tomorrow. We left the church guesthouse early as planned, just before 8.00am, and were soon clear of Deva, having bought bottled water and some food. We continued on the same main road as yesterday, so we had heavy traffic for a few miles until just beyond the town of Simeria, where there was a spur road leading to the motorway running along the valley. 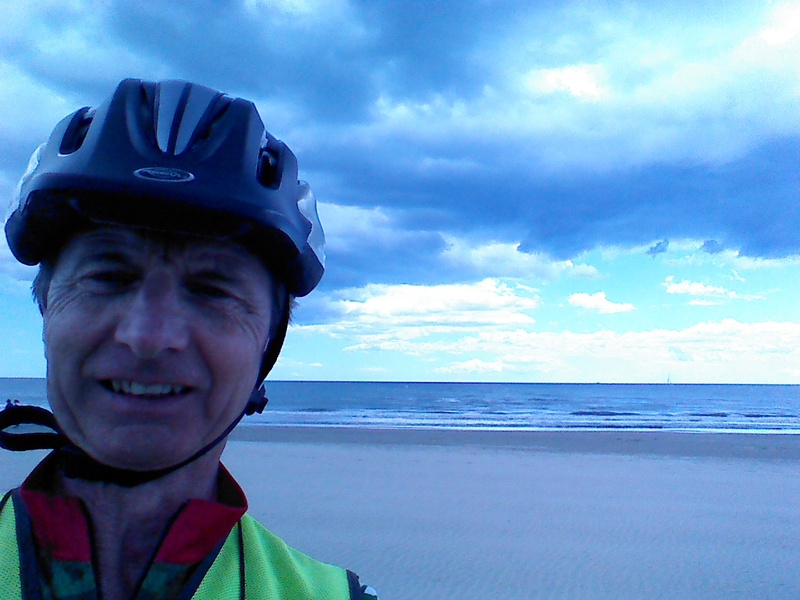 Although the traffic was lighter and the surface good, it wasn’t a particularly pleasant cycling experience, as it was in very open country mostly against an easterly headwind. Even so, with our early start we reached the small town of Sebes by 1.00pm and were able to access the two-bedroomed apartment booked by Richard (less than £30 for the night). The threatened adverse weather never arrived, but we were quite happy to have a half-day free. While Richard caught up on sleep, Roger and I explored the town centre, enjoyed capuccino and cheesecake, and bought food and drink for breakfast and packed lunch tomorrow. Later we all went for our evening meal as usual and now look forward to reaching our final destination of Cisnadioara tomorrow. and as we cycled in the day before we could see the city’s attractive riverside areas as well as more impressive ornate buildings which we saw during our evening visit. But we left the river and the first part of yesterday’s route as far as Lipova, which was through very open rolling countryside still some distance from the River Mures. We were beginning to experience some hills when Richard had the problem with his chain. But after Lipova, the town of excavations, the hills and trees closed in and the Mures valley seemed a very lush place. When we reached the village of Bata, having negotiated a few cows in the road, we had to turn away from the river another two miles or so to reach our hotel, Casa Bata. The building is in the style of a very large Swiss chalet and in a lovely setting, facing north looking over open countryside towards the tree-lined Mures river. Our accommodation was a ground-floor wing comprising two double bedrooms, a lounge and a shower-room all on a very large scale and beautifully furnished. The photographs on the walls, perhaps from the 1930s, showed groups of people, including hunting parties, on the Bulci Estate – we wondered whether the original house in some of the pictures was pulled down to build the present property, but on our way this morning we passed a sign to Bulci, so it remains a mystery. We were the only guests, various staff came and went, but no one else was there all night. Sitting on the balcony admiring the view, it was quite surreal. All that detracted from this was heavy lorries, we think carry quarried rock, passing by on the road a 100 yards away. This morning one of the staff arrived to serve breakfast and we left just after 9.30pm. A few miles along the road we took a turning and were rid of the passing lorries. We stopped at a village shop for supplies. The shopkeeper spoke French, so communication was made easier, although mostly with Richard, our language expert. The minor road took us through villages and then woods close to the river. As we stopped for water in one village, a man came out to speak to us. After a brief conversation with Richard, he went back into his house and returned with a bottle of homemade plum brandy, made from his own fruit trees. (I experienced this 40% toxic brew on my only previous visit to Romania in 1996.) After we’d each sniffed it and agreed it was very good, he gave us the bottle (fortunately a plastic one) and wished a good journey. Later the road deteriorated into an unmade gravelly track which ran for several miles through woodland, but steering between holes and bumps made it hard to appreciate the scenery. We eventually joined a mile or two of concreted surface which led to the main road to Deva. We had about 15 miles to cycle on this very busy road, and were glad of the unintended “cycle-lane” – a 3 foot strip which occasionally narrowed! A few miles before Deva, we passed a huge power station, a stark contrast to the wooded scenery of the Mures valley. We reached Deva and found our accommodation by 5.00pm. We went through a gateway and knocked at the door of a house at the bottom of the path leading to a modern church building. We introduced ourselves to the lady who came to the door, thinking she might be the minister’s wife (we’re still not sure). She led us up to the church which had several floors and guestrooms for a lot of people. We were shown to our room – four bunks to choose from, with clean neatly folded bedding. I had found this accommodation through my contact with the regional Reformed Church minister, Tibor Kiss. Unfortunately we didn’t get to meet the local minister, Pastor Janos Lovasz, who doesn’t live on the premises, but I later telephoned him and thanked him. Once showered and changed, we set out for our evening meal and were pleased to find nearby a bike shop Richard had discovered on the internet. Could they fix my cable? Yes, but they closed at 7.00pm. I had time to go back for my bike, and the job was done while we had our first drink of the evening. Cost 3€, and the man wouldn’t take any more. With all gears working we went to look for a restaurant recommended by the bike-shop owner. We eventually found it – the Red Onion. The food was good but the service was a bit slow and the waitress casual. Richard had seen that rain and thunder were forecast for tomorrow afternoon, so we decided to make our target Sebes rather than the further town of Miercurea Sibiului and to start early – 8.00am. Just time for a quick glass of plum brandy before going to bed. After breakfast Richard led us through the streets of Arad to get on the road to Bata. There were good road surfaces most of the way, but we had three unfortunate incidents. After a few miles, we started to meet with some ups and downs. Facing one short sharp hill, Richard changed gear and jammed his chain between the wheel and the large sprocket (apologies to those who are easily bored or unfamiliar with technical terms). Halfway up a hill in a temperature approaching 30° was not the ideal place to solve the problem. He managed to walk the bike to a bit of shade where we managed to release the chain. Roger had cycled on ahead and it was a while before we were able to contact him (his phone wasn’t on) and explain the 30-40 minute delay. All went well until we came to our halfway point at Lipova. Coming into the town, the road was reduced to single lane for several hundred yards, one half being dug up for reconstruction. There was no traffic control, so vehicles, including large lorries, were coming from both directions, so that some had to give way, going on to the broken up section. It was no fun for cyclists. When we reached the town centre, it seemed that every street was dug up, apparently for the construction of a new sewerage system. Having bought supplies at a supermarket and eaten in the shade of a building, we managed to escape the chaos and get on to a decent road again. With just a few miles to go, just after I said, “What can possibly go wrong now, my gear cable snapped and I was limited to using only my smallest chain ring. For those of a technical disposition, this meant I had only a range of low gears, useful for getting up hills, but involving very fast pedalling at more than 12 mph. Shortly after this, Roger and I saw a Romanian wild cat, with its very distinctive bushy ringed tail. We reached the village of Bata to find that our hotel, Casa Bata, was two miles further on. Richard phoned to make sure we could have an evening meal there, but there was a misunderstanding and it was ready much sooner than we were. The result was very rapid showers and changing. Afterwards, Richard and I examined my bike to see what could be done. We decided we could wedge the gear-shift mechanism to hold the chain on the middle ring and give me a more useable range of gears, even if it meant more likelihood of pushing up hills. The job was done with a piece of wood, a folded strip of metal, two cable ties and some sticky tape (see picture), using a variety of tools including Roger’s contribution of a saw attachment on his new multi tool. Mileage 1661, 50 miles today.